» Smart Roofing, Inc. – Featured Residential Roof – Glencoe, Illinois SMART Roofing Inc: Chicago Roofing Contractor, Roof Repair, Installation, Hail Damage, Hail Storm Damage Smart Roofing, Inc. – Featured Residential Roof – Glencoe, Illinois Roofing Contractor - SMART Roofing Inc: Roof Repair, Installation, Hail Damage, Hail Storm Damage. Smart Roofing, Inc. is proud to share this beautiful Western Red Cedar Shake roof installation in Glencoe, Illinois. This residential roof features Certi-Guard® cedar shakes made from Western Red Cedar. Cedar shakes are a highly durable roofing material. They hold up well during periods of heavy rain and snow and are impervious to bugs. Since cedar is a breathable material, it also helps preserve the structural integrity of the home by preventing condensation issues. 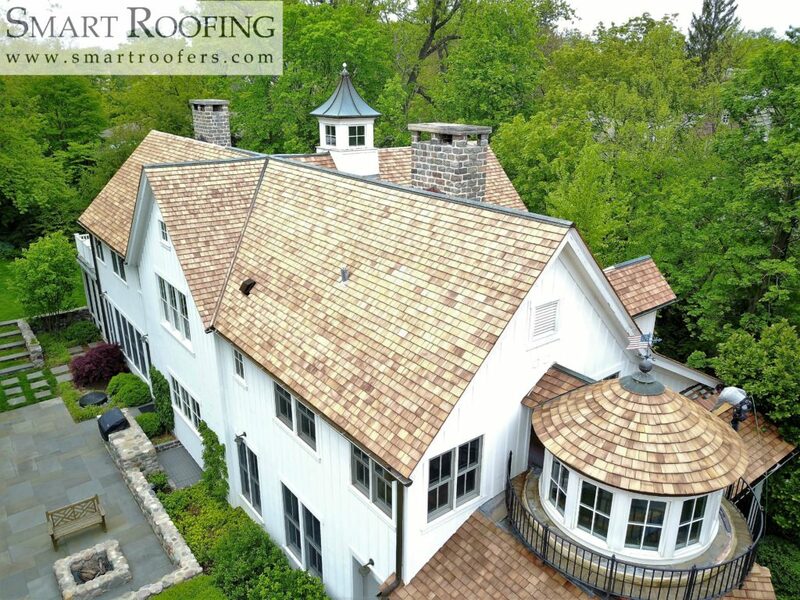 This cedar shake roof installation features premium cedar shakes that have been pressure-impregnated with fire-retardant polymers to provide permanent fire protection. These products carry the label Certi-Guard® and has met C fire testing standards. If you are ready for a new roof, contact Smart Roofing, Inc. at (847) 797-0404, or email us at contactus@smartroofers.com for your ALL of your residential or commercial roofing needs. This entry was posted in Latest Projects, News, Warnings and tagged Algonquin Cedar Shake Roof, Antioch Cedar Shake Roof, Arlington Heights Cedar Shake Roof, Aurora Cedar Shake Roof, Barrington Cedar Shake Roof, Barrington Hills Cedar Shake Roof, Bartlet Cedar Shake Roof, Batavia Cedar Shake Roof, Bedford Park Cedar Shake Roof, Bensenville Cedar Shake Roof, Berwyn Cedar Shake Roof, Bridgeview Cedar Shake Roof, Broadview Cedar Shake Roof, Brookfield Cedar Shake Roof, Buffalo Grove Cedar Shake Roof, Burr Ridge Cedar Shake Roof, Chicago Cedar Shake Roof, Chicago Heights Cedar Shake Roof, Chicago North Shore Cedar Shake Roof, Chicago Northwest Suburbs Cedar Shake Roof, Chicago Suburbs Cedar Shake Roof, Cicero Cedar Shake Roof, Country Club Hills Cedar Shake Roof, Countrysie Cedar Shake Roof, Crestwood Cedar Shake Roof, Crystal Lake Cedar Shake Roof, Deer Park Cedar Shake Roof, Deerfield Cedar Shake Roof, Des Plaines Cedar Shake Roof, Dundee Cedar Shake Roof, Elgin Cedar Shake Roof, Elk Grove Village Cedar Shake Roof, Elmhurst Cedar Shake Roof, Elmwood Park Cedar Shake Roof, Evanston Cedar Shake Roof, Evergreen Park Cedar Shake Roof, Forest Park Cedar Shake Roof, Franklin Park Cedar Shake Roof, Glenview Cedar Shake Roof, Highland Park Cedar Shake Roof, Huntley Cedar Shake Roof, Indian Head Park Cedar Shake Roof, Inverness Cedar Shake Roof, Itasca Cedar Shake Roof, La Grange Cedar Shake Roof, Lake Barrington Shores Cedar Shake Roof, Lake Forest Cedar Shake Roof, Lake in the Hills Cedar Shake Roof, Lake Villa Cedar Shake Roof, Lake Zurich Cedar Shake Roof, Lemont Cedar Shake Roof, Libertyville Cedar Shake Roof, Lincolnwood Cedar Shake Roof, Long Grove Cedar Shake Roof, Lyons Cedar Shake Roof, Maine Township Cedar Shake Roof, Melrose Park Cedar Shake Roof, Morton Grove Cedar Shake Roof, Mount Prospect Cedar Shake Roof, Naperville Cedar Shake Roof, Niles Cedar Shake Roof, North Lake Cedar Shake Roof, North Shore Cedar Shake Roof, Northbrook Cedar Shake Roof, Northfield Cedar Shake Roof, Oak Brook Cedar Shake Roof, Oak Forest Cedar Shake Roof, Oak Lawn Cedar Shake Roof, Oak Park Cedar Shake Roof, Palatine Cedar Shake Roof, Palos Cedar Shake Roof, Park Forest Cedar Shake Roof, Park Ridge Cedar Shake Roof, River Forest Cedar Shake Roof, Riverside Cedar Shake Roof, Rolling Meadows Cedar Shake Roof, Roselle Cedar Shake Roof, Rosemont Cedar Shake Roof, Schaumburg Cedar Shake Roof, Schiller Park Cedar Shake Roof, Skokie Cedar Shake Roof, South Barrington Cedar Shake Roof, St. Charles Cedar Shake Roof, Streamwood Cedar Shake Roof, Sugar Grove Cedar Shake Roof, Tinley Park Cedar Shake Roof, Vernon Hills Cedar Shake Roof, Westchester Cedar Shake Roof, Western Springs Cedar Shake Roof, Wheeling Cedar Shake Roof, Willow Springs Cedar Shake Roof, Wilmette Cedar Shake Roof, Winnetka Cedar Shake Roof, Wood Dale Cedar Shake Roof, Woodridge Cedar Shake Roof. Bookmark the permalink.